Auburn fans are doing everything they can to keep the Toomer’s Corner tradition alive. And they’re getting pretty dang creative. 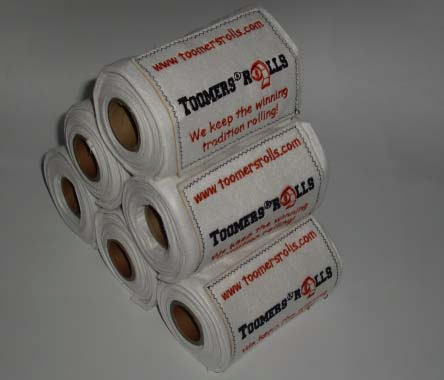 To wit: the Toomers Rolls scarf. Following the Iron Bowl, SEC Championship and BCS Championship games, representatives from the Art Department gathered large quantities of toilet paper that had been used to roll the trees. The plan was to recycle the paper into 8 X 10 pages with the scores of the respective games printed. The money collected from selling the paper would have gone into a special fund, and used to fund speakers, buy supplies, etc. But, the University would NOT allow this, because phrases like “Toomer’s Corner”, “Iron Bowl” and “BCS” are trademarked/copyrighted. Either the people who came up with the idea of the scarves ( a great idea) decided on the “it’s better to beg for forgiveness than ask for permission” tact, or Auburn University has some skewed values. Fundraising? A no-no. Private enterprise? Go right ahead. Hey Aubie, we fully respect the Toomer’s Corner tradition and have always had the perspective to start the business in good faith. We had the pleasure of meeting the Lipscomb family, who owns the Toomers trademark, and signed a licensing agreement for the use of the trademark on our product. Come on, Auburn grads are smarter than that! Wow Jen, I gotta admit, I was thinking the same thing Aubie was, but your answer was AUsome. Any of the proceeds going to the fund to save the Toomer’s Oaks? Aubie – trademark/copyright issues are pretty complicated. They can’t authorize the use of intellectual property if they don’t own it, as is the case with “War Eagle” not appearing in EA Sports NCAA series.